3rd May 2016 - Moriarrty, New Mexico to Santa Rosa, New Mexico. 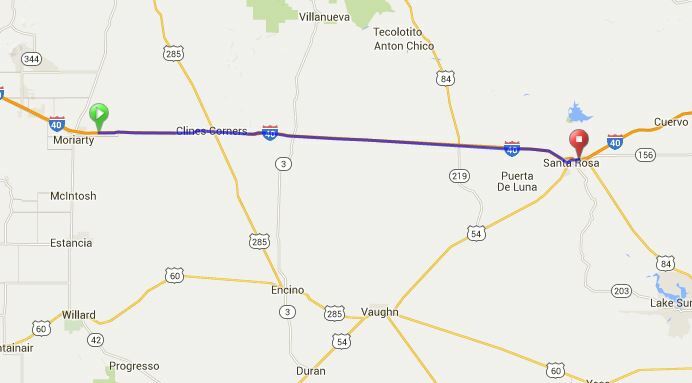 Another day in the State of New Mexico - and it is a pretty straight line on the map continuing on our easterly journey. We could see from the elevation profile that we would have a bit of climbing in the first 30 kms, but it should be relatively gentle. But after that - we were hoping for pretty much all downhill as we would descend about 800 metres. I chose to put our wonderful supporters John Wisse, from Gecko Rope Access on this page as they had asked that their day be an "easy" day of riding for us! With all that downhill - I thought - this is it!!! As it turned out - it the last time I predict an “easy” day!!!. It was far from it!! The first 30 km we expected to be uphill – and so it was – but then we expected downhill – but didn’t really seem to get it!! Well – there was some downhill, but immediately followed by an uphill. Generally the elevation profiles I have prepared have been very accurate – but this one wasn’t!! What made it worse was a strong North Easterly wind which basically blew straight in our faces making it necessary to pedal downhill after struggling uphill. It wasn’t a formula for fast progress – and to top it off the expected 122 kms blew out to almost 130 kms!! Today’s ride was, apart from a small section at the start and at the end all on the I-40. Traffic seemed light in the morning, but built as the day went on. We took a “lunch break” at one of the off/on ramps, and had 2 “mini-stops” in roadside rest areas. The rest areas are great and have good toilet facilities as well as areas specifically for running your dogs. One of them today even had metal stockyards where you could offload your horse for a bit of R and R!! Great facilities I reckon for travellers. When we see signs saying road works ahead, it sets off alarm bells that we need to take extra special care. So often they cause a lane reduction - so traffic then uses "our" shoulder! We always look for the safest route, and in many instances there have been no workmen around. We therefore opt to go inside the "cones" if possible - much safer! We took a break at a service station / tourist shop for a hot drink and some food, and were amused by the large life-like stuffed animals they had dotted around in the shop amongst all the normal tourist things for sale. With about 20 kms to go Annie picked up No 7 puncture – to make the count - Don and I, 4 each and Annie 7. Compared to other rides we have done we are absolutely gob-smacked by this number! Particularly Annie as she had completed the New Zealand ride, and the east coast of Australia ride with me with ZERO punctures!! I didn't have that much luck on thise rides, but i had done John O'Groats to Land's End in the UK last year with a ZERO count! Another slight error today was that I opted to go on to Route 66 as soon as possible on approaching Santa Rosa so we could ride through the town. These towns really are quite disappointing, well to be honest, I find them very disappointing! So many abandoned buildings etc. - the glory days have certainly gone since the building of the I-40!! Taking this early exit also gave us another steep climb - just what we wanted after a harrowing day!! The Santa Rosa RV and Campground is a lovely spot – and when we got here – the wind stopped (typical), the sun shone and it was really quite hot!! First time in ages that we have felt warm outside without jackets and jumpers on!! If this keeps up - I imagine that I could soon start moaning because it is too hot after a week or so of moaning that it is too cold!! We finally have a “grassed-site to pitch the tent on!! This is huge progress!! We did ask to be moved from where we were originally assigned - way at the back of the camp in an unkempt area, to a mown area a whole lot closer to the amenities block - and we are sure this was the reason the wifi to our area appeared to get "turned off" mid evening. The Manager had a "family function" on so couldn't be contacted! There was a small restaurant at the camp and when we arrived we had been told if we wanted to dine there we would have to do so by 6:30 pm as after that it was closed for the above-mentioned "family function". This we did - and it was a pretty good meal they served!! In camp we met a guy from Oregon who had just finished riding the “Southern Tier” bicycle route across USA (lower down compared to what we are doing. We were thrilled when he told us he had had 10 “flats” pretty much all in the first half of his ride. Maybe things will improve for us – and good to hear we are not the only ones suffering!! His wife had driven their car and caravan as support and they were with other riders during the ride, but travelling back by themselves now.